Be in the know and sign up for email updates from Authentic Cuba Travel. Our monthly Newsletters are full of great information on Cuba Education Tours, Cuba Study Tours, Cuba Cultural Tours, Cuba Festival Travel, Cuba Architecture Travel, Cuba Nature & Bird Watching Travel & Sport Tours. Last minute discounts on Authentic Cuba Tours, contests and featured Cuba tours, all to keep you up to date with the world of Authentic Cuba Travel. Cuba is divided into 15 provinces and 169 municipalities. The fifteen provinces are: Pinar del Río, Artemisa, Mayabeque, La Habana, Matanzas, Villa Clara, Cienfuegos, Sancti Spíritus, Ciego de Avila, Camagüey, Las Tunas, Holguín, Granma, Santiago de Cuba, and Guantánamo. Cuba forms part of the Greater Antilles along with Jamaica, Puerto Rico, Haiti and the Dominican Republic. The crocodile-shaped island is 80 km from Haiti, 140 km from the Bahamas, 145 km from Florida, 210 km from Mexico, and 146 km from Jamaica. More than 4,000 islands and cays form the Cuban archipelago. The southern coast includes the archipelagos known as Jardines de la Reina and the Canarreos. The northeastern shore is lined by the Sabana-Camagüey Archipelago, and the Colorados Archipelago lies on the north-western coast. The main island’s 5746 km of coastline include more than 200 bays and 289 beaches. The second largest island in Cuba is the Isla de la Juventud (Isle of Youth) in the southwest, with an area of 2200 km 2. Geologically at least, Cuba is part of North America; the boundary between the North American and Caribbean plates runs east–west under the Caribbean Sea to the south of the island. Along the plate margin is a deep underwater rift valley, which runs between Cuba and Jamaica. This feature is quite close to the Cuban coast to the south of the Sierra Maestra, with water plunging to 6000 m only a few miles offshore. Earth movements along the plate boundary make the eastern region of Cuba the most earthquake-prone part of the country, with earthquakes in Bayamo in 1551 and Santiago de Cuba in 1932. Cuba is also being tilted gradually to the north. The northern coastline is gradually emerging from the sea. Old coral reefs have been brought to the surface, and now form much of the coastline, so that much of the northern coast consists of coral limestone cliffs and sandy beaches. By contrast the southern coastline is being gradually submerged, producing a series of wetlands and mangroves running from the Ensenada de Cortés in the west to the Gulf of Guacanayabo in the east, with fewer sandy beaches than the north of the island. The Zapata Swamp, the largest wetland in Cuba, is also the largest in the Caribbean, and the best preserved to date in the Antilles. The region encompasses blue-water beaches, forests, rivers, lakes, flooded caverns, ponds, and swamp prairies. Rivers are invariably small, most of them less than 100km long. There are 30 south-flowing and 11 north-flowing. Cuba's longest river is the Río Cauto in the southeast (343 kilometers). It is navigable for less than half its length. Limestones of various types cover about two-thirds of the island. In most areas, there is a flat or gently rolling landscape. The most common soils, both formed on limestone, are terra rossa, stained bright red by iron oxides, and vertisols, black, fertile, and developing deep cracks during the dry season. Mountains and hills make up a quarter of the Cuban territory. There are three main mountain areas in the island. In the west, the Cordillera de Guaniguanico is divided into the Sierra de los Organos in the west, with thick deposits of limestone which have developed a distinctive landscape of steep-sided flat-topped mountains called ‘mogotes’; and the Sierra del Rosario in the east. In the center of the country is the medium-height Escambray mountains, which reach 1140 meters. The Sierra Maestra in the east has Cuba’s highest mountains, rising to Pico Turquino (1974 meters) and a different geological history, with some rocks formed in an arc of volcanic activity around 50 million years ago. The country’s most important mineral deposits are in this area; nickel mined near Moa is the third largest foreign currency earner, after tourism and sugar. Authentic Cuba Travel is offering a new level of service for our loyal teachers: the FREE pre-departure Cuba Explore Tours. All teachers may qualify! 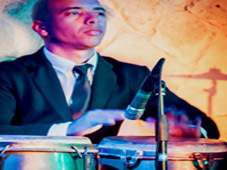 Nobody knows Cuba as Authentic Cuba Travel! Our staff is fluent in English and Spanish and have lived and worked in Cuba Travel Industry for over 10 years minimun. Guarantee! 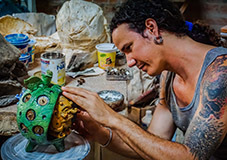 Authentic Cuba Travel's Cuba cultural tours feature visits to Cuba’s premier art galleries & artists's studios.